It’s been a while since I posted here, but things have been busy. (I know, excuses, excuses!) Here’s to hoping I can get a few more posts out over the summer. Way too often, when people set out to start a nonprofit organization, I find that they have a great idea that will certainly benefit the community, but they often don’t realize the full amount of work that’s needed to successfully put this idea into practice. In fact, when I ask founders what they think about having actually started a nonprofit when they are a few years into it, they often say they wouldn’t have done it if they knew what they were getting into. I don’t believe them. From what I’ve seen, their passion for their cause is very great, and they would simply have found a way to pull off their project in a more pragmatic way. What these founders often need is a simple reality check at the outset, some common sense advice. So today, I’m focusing on an event I’ve scheduled for June 14 here in Portland, Oregon. I don’t usually focus on an event like this in these blog posts, but for those in the Portland area, it will be a great way to get a lot of useful information, so I’m making an exception to my usual routine and spelling out what will happen at this summit. Often when people set out to start a nonprofit they assume much of it will be pretty simple and straightforward. My blog readers know different. 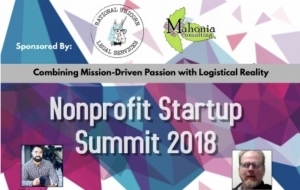 There are a lot of things to consider, a lot of bureaucratic steps that need to be taken, and many “behind the scenes” tasks that need completing, or the nonprofit will face some severe but all too common mistakes down the road. This event is designed as a reality check for people who are ready to move forward. But it will be fun. I promise! There will even be delicious food and live folk music at lunch! Michael Jonas, Attorney and Owner of Rational Unicorn Legal Services. Michael will be talking about legal issues for nonprofits. Carla Axtman, Vice President of Communications of Prospect. Carla will cover how to tell your new nonprofit’s story. Stanley Carpenter, Nonprofit Banker for Beneficial State Bank. Stanley will cover the important things a new nonprofit needs to consider when opening a bank account. Stephen Brooks, Co-Founder/Co-Manager of Charitable Partnership Fund. Stephen will talk about fiscal sponsors and incubators, that is alternative ways to start your nonprofit organization. Erin Zollenkopf, Nonprofit Accountant/Partner of Susan Matlack Jones & Associates. 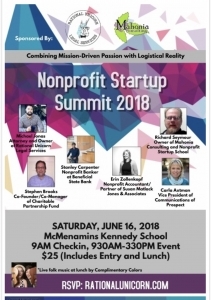 Erin will speak on “Keeping Track of the Money: What New Nonprofits Need to Know”. Live folk music at lunch will be performed by Complimentary Colors. Please visit our Eventbrite site for tickets and to RSVP. Lunch will be buffet style. We will make best efforts to have both gluten free and vegan options. If there are any other specific allergies, please let us know as soon as possible after RSVPing so that we can accommodate accordingly. Feel free to share this with anyone who might enjoy attending. Remember though that space is limited so RSVP as soon as possible to reserve your spot! I look forward to seeing many of you on June 16th.